Captain Paul Watson founded the Sea Shepherd Conservation Society in 1977, an international non-profit organization dedicated to ending the destruction of natural habitats and the slaughter of wildlife in the world's oceans. Sea Shepherd's journey to becoming one of the most effective marine conservation organizations marked by direct action began with just one ship, befittingly named SEA SHEPHERD. Their main task was to ram and damage the illegal whaling ship SIERRA. The campaign was Sea Shepherd's first direct intervention, focussed on tracking down and stopping the SIERRA. In the end, Captain Paul Watson preferred to sink the ship rather than letting it fall into the hands of the pirate whalers. 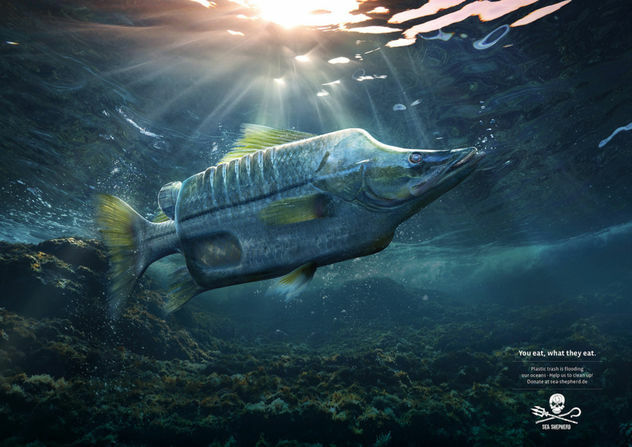 Platinum c/o ANALOG/DIGITAL for Sea Shepherd "Plastic Fish"